Vlambeer are very good at shooters. 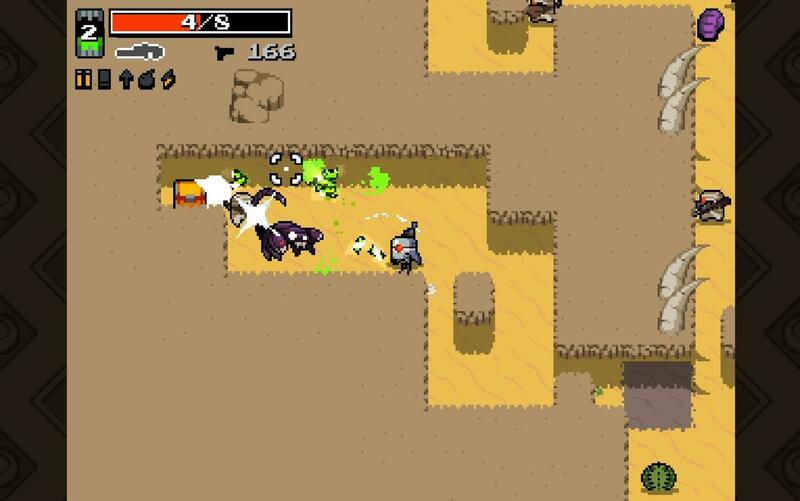 This much was evident when they released Luftrausers, and we’ve been seeing this for some time now with the Early Access progress of Nuclear Throne. Now that the game’s released? I’m feeling kind of childish about skill gates. There is a feather and muscle shaped hole in my heart, Vlambeer… But I won’t rest until it’s filled! See, for most of the game’s long Early Access period, you could unlock most of the characters fairly quickly, which meant someone like me could get everything except the kitchen sink early on, and then enjoy testing characters, and Attachments Were Formed. If you guessed that both of my favourite characters require getting further in the game than I’ve gotten, you would be 100% correct. And I am annoyed. But I’m perfectly willing to admit that it’s a childish annoyance. After all, once I get them, I’ll know I’ve earned them, because Nuclear Throne is not an easy game. It is a game requiring a fair amount of skill, and my skill with it… Is not so hot. Essentially, each character you can play, unlocked at the beginning or not, has special abilities, that, combined with the sometimes silly weapons you find in the weird wastelands, can either help or hinder you. For example, although Melting is fragile enough to die in one hit, he can make all the corpses he’s made on the screen explode. If you’re clever about this, you can set up quite a chain of death and explosions. Adding to this already amusing mix, you have skills and Crowns, the latter of which can only be found in certain areas, and the former gained by collecting Rads. Yes, you’re mutating to be strong enough for the Nuclear Throne… And the mutations are kind of random, picking from four each level. The majesty of certain mutations can’t be captured in a screenshot. In less than 0.2 seconds, all the things shown except me are going to die, because I hit someone so hard their corpse killed everyone else. Another reason I haven’t gotten amazingly far is because I’m overfond of melee weapons, preferring to build toward the idea of getting them… Which won’t always happen. And even when it does, it’s a risky proposition, as, while most melee weapons don’t use ammo, and most can also bat projectiles away, the most damaging melee weapons have long cooldown times that abilities can only go so far to fixing. Nonetheless, under the right situation, and with the right character (Steroids, unlocked by reaching Area 6 of the game), I could be dual wielding shovels that not only murder people left and right (And forward! ), I swing them faster the harder I get hurt, and I don’t get much cooldown on them so long as the death keeps coming. Of course, both mutations and weapons are luck based, so the game is more about adapting to your situation than what I do, which is aim toward a build and pray it comes through. Aesthetically, it’s pretty cool. The soundwork is pretty darn good, with explosions, the meaty sounds of bullets hitting flesh and shovels hollowly whunking through the air, hisses, and the dramatic music, courtesy of [insert]. Meanwhile, the pixel graphics are simple, easily read in most places in the game, and you can quickly identify your immediate threats, which is bloody useful, because this game does somewhat depend on memorisation. Take a grenade launcher into the sewers, for example, and you’re probably in trouble. There’s a hell of a variety in weapons, and later tiers can get really powerful, like the flame shotgun (Spread shot that sets enemies on fire), the Splinter Gun (Fires three mini crossbow bolts in a shotgun like spread), or the Plasma Gun (Not only kills pretty much anything it hits, it explodes, too!) Of course, the more powerful the weapon, the more ammo or time it’s going to take to use… So you have to be tactical. It is often hard to see the real threat in crowded situations. I thought I’d killed the ninja. I was wrong. 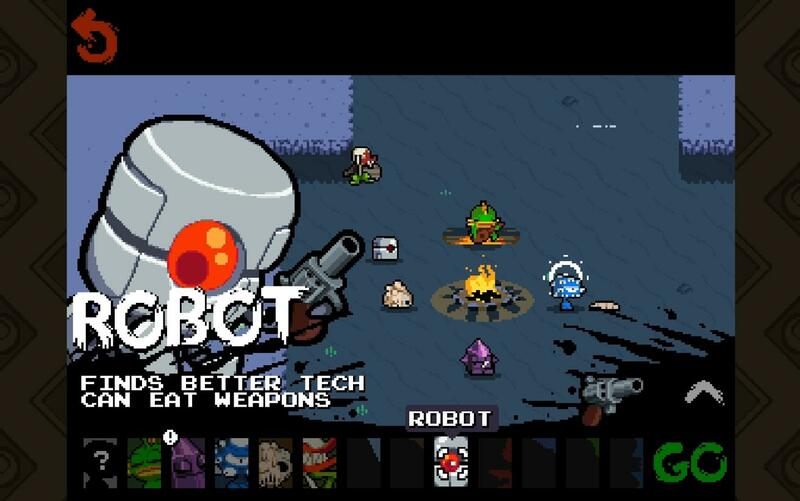 Overall, though, if you like mouse and keyboard or twin-stick shooters, Nuclear Throne is definitely worth the price. Of course, a lot of you knew that already, but for those who didn’t? 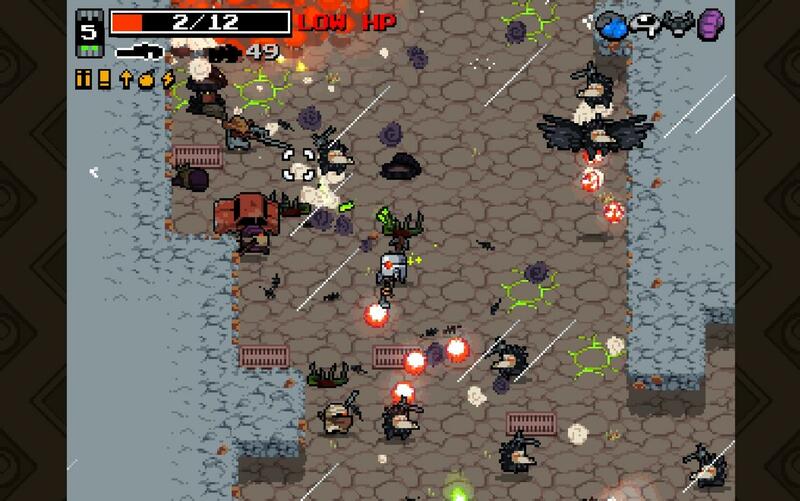 Nuclear Throne is fun. And you can adjust the screen shake to whatever you prefer. 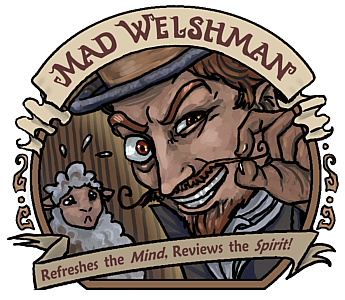 The Mad Welshman grimaced as he looked down at his form. He needed to glow harder. His quest demanded it.